When Unlocking Autism held the first Power of One Rally in Washington, DC in April of 2001, we were just beginning to wonder about new behaviors that our son Riley was exhibiting. Eight months later, we had a word for it. By the time Unlocking Autism rallied the various national autism groups to band together again in April of 2002, I was still learning how to find our way post diagnosis. For the second year in a row, Unlocking Autism had rallied the various factions of the autism community to come together on day of peace. People came from all over the country. All fifty states, other countries and every autism group – all represented on a rainy, muddy day on the Mall in Washington, DC. In 2004, the community was beginning to fracture when Unlocking Autism issued another call to unite us equally at The Power of One. 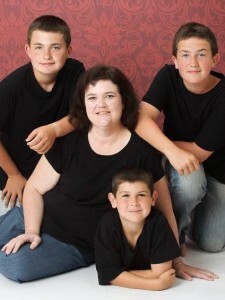 I was pregnant with our third son, Patrick, and unable to attend. It was difficult to be home-bound in Chicago while my new friends were gathering on the Hill watching Dan Marino pass a football to various congressmen. By then, we had found our way and I was serving Unlocking Autism as a regional volunteer leader for the mid-western United States. Everything eventually comes around again. Now, Unlocking Autism has issued the call once more. This time we will not rally. We will all march together. You better believe I will be in step with my brothers and sisters in our autism family at The Power of One March on April 2nd, along with my three sons, who are now all diagnosed with an autism spectrum disorder. We will be “assembling the peaces of the puzzle.” It took me a minute to catch on to that slogan and I thought they had misspelled the word, but then it hit me like a ton of bricks! If everyone in our community would stop holding onto their “piece” of the puzzle, lay it down and work together then with “peace” would come solution. Each one of us brings a different life perspective. What our family experienced with our sons may have some similarities to what you or your family experienced, but chances are that each situation is ultimately unique. Each one of those distinctive opportunities gave us various skills and broadened our wisdom in a specific way to be a help to one another. Some body parts might be more important than others because they are vital to being alive, but if you don’t think your big toe is important, try navigating my sons’ bedroom, full of Legos and action figures, in the middle of the night in the dark to check on him. We have to lay our pieces down…in peace. We are all unlocking autism and we are all better together. Mary Kay Betz lives in the Chicago area with her three sons – Ryan, Riley and Patrick. She has volunteered with Unlocking Autism since 2004 and served as the Executive Director for the Autism Society of Illinois from March, 2007 to March, 2015. Because her service to her fellow man is ever evolving, she is now studying to become a nurse.